Blue Sky... Kayak or Not??? Should it be Allowed in Kayak Tournaments??? There has been a ton of controversy over the Blue Sky over its inception. Is it a kayak, paddle boat, or pontoon boat? No one really knows however there has been an uproar on weather or not it should be allowed in kayak fishing tournaments. Is there really an advantage to this boat? Who is allowing it in their tournaments? Let’s get into the details. The Blue Sky hasn’t really been classified as a kayak, however it’s inception was through a kayak company. Jackson Kayaks teamed up with Blue Sky Boatworks to make this boat a reality. It has a lot of modern day fishing kayak features. It runs off a Jackson Flex System Drive. It’s incredibly stable just like many other kayaks, but a little more possibly. It Features a higher seat than all kayaks, which makes it comfortable for all day fishing trips. At first glance however it resembles more of a paddle driven pontoon boat. When you really break it down I feel it has more features that fall inline with a kayak rather than a peddle boat. The KBF has said it is allowed in all of its tournaments, but many of your local clubs have banned it. I think the reason small clubs have banned it, is because they really don’t know if the boat classifies as a kayak. However some of these same clubs will allow electric driven motors mounted to kayaks in their tournaments. In my opinion I feel this is a far greater advantage then being in the Blue Sky. You still have to exert energy to peddle the boat. Electric motors save the anglers energy, and also allows them to cover more water during a tournament compared to a paddle or peddle driven boat. I think this boat is just still too new to the market, and at some point more clubs will allow it to be used because it will draw larger crowds to their series. Overall I love the concept of the Blue Sky. I would categorize it as part of the kayak family. I know from showing this boat at the Chicagoland Fishing show it really appealed to the older crowd, that couldn’t necessarily fish out of a standard fishing kayak. I am curious to see what the future will hold for this boat. In due time I feel it will be accepted, and rub off on folks. I love the thought and features behind it. I think we will see more great things from Blue Sky Boatworks in the future. 2019 has set in, and I have a ton of goals on the plate for this year. The podcast and everything that comes with it has grown, and I feel the need to keep up with the demand. Keeping Episodes and Guests flowing on the podcast. Videos consistently uploaded to the youtube channel. Keep good posts flowing on the Instagram and Facebook pages. Keeping the relationship with my sponsors good and intact. Doing more for the community such as seminars, and Demos. This is just the start of the goals that don’t include fishing. It is going to be a great ride and here is the plan. If you haven’t already please give us a follow and like on our Facebook and Instagram page at @paddlenfin. We try to post at a minimum once a day. We try to keep you up to date with what we are doing on and off the water that is related to kayaking and fishing. What I would like to do more of this year is live streams. I have attempted a few so far, but just haven’t built up the confidence yet I believe. Live stream is a little different than youtube. Youtube I can edit out all the bad parts. Live it is what it is. Look for more of this though, as I am going to push myself to get over that hump. Sponsorships and Pro Staff positions I hold very personal. I treat every company I work with as if it were my own. I recently recorded a Podcast on my personal pod (Slydog Fishing) about sponsorships and pro staff positions. You have to treat them as a job. I take a lot of pride in working with these folks, as they put their pride in supporting me. Through this year I am going to try to pick up a couple more that I have my mind on. Hopefully it works out, but if it doesn’t I will still stand by those companies and support them. It will also give me the motivation to work harder for them and help promote their great products. Some have told me I do too much for these companies, but I feel that the more you do, the more you will get noticed, and the more support you will get from them. Again I treat this as a job, and like any job the harder you work, the more the boss notices, and the better chance you get at moving up the ladder. There is nothing I love more about our sport than connecting with people, and helping educate them on our sport that I am dedicated too. I’ve always been a people person that has tried to educate through my experiences . Sure I think you can learn a ton from books and videos, but what better way to learn than getting out there and doing and showing folks first hand. Hands on teaching I think settles into the brain a little more. I’m currently working on an intro to kayak fishing seminar that I hope to hold at my Local paddle shop Rocktown Adventures. I would also like to perfect it, to the point I could present it at fishing show seminars a year from now. I’m a firm believer that through education we can grow this sport. If I can get a few extra people in kayaks to fish from this year I will feel accomplished . I want to grow that as well in 2020. Demos are another thing I will be doing as well. Not only boat demos, but I would like to do fishing demos as well. Help others learn techniques in their fishing to better their experience on the water. Help folks find that right boat to suit their needs on the water is key to that. I don’t want to see others make the same mistake as I did when I bought my first kayak. Demoing boats has always been something that I have preached on the podcast. The boat may look cool but is it going to perform on the water as you need it to? That’s always the question, and if I can help people answer that, I feel it is going to help better their fishing experiences on the water. The podcast like I stating in the beginning has grown much larger and faster than I could have ever imagined. I remember when we hit our first 50 downloads. I got excited that people were interested in what we had to say, and what we were trying to do with the community. Our focus has always been and always will be to educate through our guests and our experiences on the water. I think we have done a pretty good job with that thus far. In 2019 this is only going to get better. We have already been talking with some potential guests, and to say i’m excited is an understatement. Not only the guests, but the listeners. We are holding our first roundtable podcast this next episode, and it’s all listeners. How cool is that? I feel that’s our way of giving back to those that support us. Let the listeners have a voice, and maybe help them out in anyway we can. I can not say thank you enough to all of you that support us along this journey! It is truly humbling! With all of this being said you can expect just what the title states. More Content. I want to help grow and educate through all of this. It is a passion that burns inside of me, I know have to transpire that into the ways I just stated. I know it’s not going to be easy, but I know I will learn something along the way as you all are learning as well. So together I hope we can continue to grow and hone in on our skills. 2019 is going to be an epic journey. Get ready for the ride, and I hope it’s a good one for all of us! Preparation starts way before the season gets close to starting for most. As tournament schedules come out for the upcoming season , it’s time to put a well thought out game plan together. I’ve already started filling up the calendar with tournament dates, fishing shows over the winter, and pre fishing plans and accommodations . 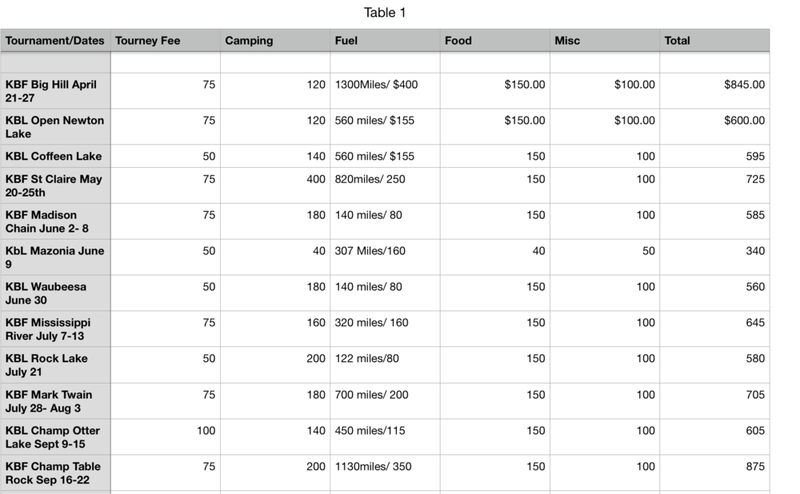 Starting spread sheets to figure out tournament costs, camping fees, and estimated fuel costs for travel. The tasks seem grueling however it’s filled with excitement to know how much time I’ll be spending on the water next year. The tournament series I plan to fish are the KBL and the KBF Central division Trail Series. I may throw in a couple of KBF Open or Hobie Bass Open events into the mix as well. There are the occasional online events that will be thrown into the mix just to keep the AOY Points accumulating. This will be my rookie year. If I can get in contention for rookie of the year it would be a huge accomplishment even coming in the top ten. The biggest focus I need to have is just having fun and enjoying the fact that I have been blessed with a huge opportunity to contend in so many events this year. I recently read an interview with KBF legend Jody Queen in which he stated his success can be attributed to the amount of time he spends on the water. After tournaments are marked down it’s time to figure out costs for the season. In the charts above you see my breakdown for each tournament with dates, locations, cost of entry, cost of camping, fuel, food, etc. I believe a well thought out plan is the best way to accomplish anything. I tried to think of my expenses, and how feasible it was to make this my mission for the 2019 season. The things I haven’t included yet were the online tournaments along with fishing licenses. I believe this is just a start and I am sure things will change slightly as the season approaches. Hope this helps you all when planning out your tournament season. Life is a gamble, and I'm going "all in" on the journey. Driven by the passion that young child felt after landing a fish of a lifetime and that same 12 year old boy surfing through a Cabela's catalog, I'm going to dedicate all my time towards fishing and content creation. The hope is to try to navigate my way through the sea of the fishing industry and hopefully land on my feet. I think this new adventure in the "game of life" is definitely a far fetched dream, but it is possible with determination. Do I want to spend my days thinking "what if"? Do I want to regret not even trying? If it's possible, I believe it's doable. I've worked hard since I was 13 years old, dedicating a majority of my free time to work while missing family, holiday, and social events. We as a society have been taught over the years that you need to work a 9 to 5 and have the big house, and white picket fence, but is that what really makes us happy? Slaving away doing something we aren't super passionate about? Have you ever thought; "Would it be better to be poor and doing what I love rather than miserable and stressed out to achieve society's standards?" If you're putting effort in to doing what you love and what you're passionate about, you can and shall succeed. As most know, and for those that don't, I fish from a Bonafide Kayak. The companies tag line is "Live The Story You Want To Tell". The story I want to tell, on my new mission in life, is "Follow Your Dreams". Put yourself out there doing what makes you tick. Doing that thing that gets you excited when you get out of bed in the morning. Be passionate about it, and show others and teach others how to be passionate about it. If we never shared our passions things would never grow. I've been a fisherman most of my life, however, when I found myself fishing from a kayak I found my true passion. The kayak community has been a pretty tight knit family that is starting to grow at a rapid rate across the country and over the world. I've fished in many places, and on many different vessels, but the one that brings me more connected to the species I seek has been the kayak. Kayak fishing is like a strategic plan from the first thought of heading out. It's like a game of chess, and when you land that first fish it's like you just took your opponents Queen. Checkmate comes at the end of a successful outing. We don't always achieve checkmate, but that's the beauty of it. It's what drives us back for more. It's what continues to teach us and better ourselves as fisherman. At the end of April/Beginning of May next year I am leaving the company I started behind, and plan to fish full-time creating content, traveling, and fishing tournaments. I'm anxiously awaiting tournament schedules to come out for the 2019 season so I can start planning. Throughout the journey my plan is to document my daily endeavors of the journey. The good, the bad, and the ugly. The goal is to succeed and show people that if you follow your dreams and put in the hard work you can achieve that goal you thought was never possible. I'm nervous, excited, scared, and anxious all at the same time. However I know my keys to success will be from the love and support I receive from my family and friends, and the dedication I am going to put forth. 2019 is going to be a year that I will never forget regardless if I fail or succeed . The journey alone will give me strength, knowledge, and memories to last lifetimes. So I invite you all to join me along this crazy journey , and hopefully together we learn a lot and show that dreams are achievable.